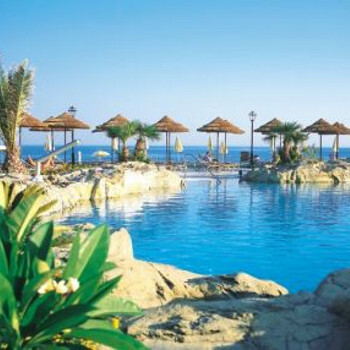 We stayed at the Atlantica Imperial resort, Rhodes. We found the hotel to be really very clean. We had a lovely garden room which was perfect for us and it was just a stroll from the beach. The hotel staff were very friendly and nothing was too much trouble. The food choice was very good, something for everyone. Entertainment was fairly low key. We would certainly go back again to this hotel. The food choice was excellent with several themed nights. The staff were all very friendly and helpful. Bar staff quickly got to know your order and would replenish drinks without asking (we were all inclusive so they weren't trying to get more money out of us). The rooms were large and comfortable, although the bed was hard. When we mentioned this the management put a thick blanket topping on the mattress to soften it for us. You do have to pay for the minibar and safe if you want to use them. Rooms were cleaned daily and towels changed. Sunbeds were plentiful pool towels were provided. The hotel was very clean, although the cutlery was sometimes still a bit dirty from the last person that used them, imalways had a proper look every time i ate just to make sure. The food was great, although i would agree with some people that the set up was a bit confusing at times, but this didnt spoil our dining experience. The location was ok fof us, the bus stop was right outside the hiotel for Rhodes town or Lindos, we went one night and it was really hot, so it would be stifling during the day, Kolymbia itself isnt very big, there were a few gift shops etc, also eateries and bars, none of your rowdy stuff which was great. The staff all spoke good english and were very pleasant, the waiters and waitresses did a good job at meal times, clearing up after you etc. The entertainment was different every night although there was a resident duo which kicked the night off and finished it off too, they were caled Jacks field.. (i think thats right, or maybe Jacksville).. brill singers, no up to date stuff, mostly golden oldies, cracking singers though.There was game show nights also murder mystery night, there was also a comedian on called Dave Bucks who was ace, the entertainment reps were good too, Gareth, micheal, rosie and Charlie. there was aqua aerobics at 11am then games at 12, then the quizz at 3pm so it broke the day up. Be warned that people, mostly the British got up very early to put the towels on the sun beds,we noticed the majority were british in the hotel, a few germans too. The only downside for us and a lot of other people at the hotel is that we booked and paid a lot of money, nearly 3 grand..for a couples hotel, which it does state in Tomsons brochure, but were a bit peeved off when people came with children, about 5 kids there, a couple of them at screaming age which didnt go down too well in the restaraunt when we were eating or relaxing on the terrace.. I think something should be done about this, its not really fair. atlantic imperial hotel, kolombia, rhodes. the hotel premises were immaculate, both inside and out. if one reported a small problem it was dealt with immediately. the choice of food, both at breakfast and dinner times, was enormous. food was always piping hot, and attractively presented. cook while you wait was always available. the wine list was extensive, and not overpriced. the hotel is situated in a beautiful bay, surrounded by hills. a variety of small shops are close by, as well as bars and tavernas. there is a bus stop at hand. the hotel staff were excellent in every way - pleasant, polite and friendly, and most efficient. gareth, danny, ruby and rosie provided a variety of entertainment throughout the day and evening. everything was well organised. they are without doubt the best set of hotel entertainers whom we have ever seen. we would certainly visit this hotel in the future, and would not hesitate to recommend it to other people. Super hotel in every way. If you are thinking of booking then just do it. Fantastic food,staff,entertainment etc. Adult only no kids. Can`t fault it at all. Thompson gold standard in every way. Great out door pools. On the beach what more could you want? Would go back again but its never the same twice so we try to go and visit the rest of the world. We stayed from the 13th August for 2 weeks for our Honeymoon and upgraded to all inclusive as we arrived at 22 euro's per person which is highly recommended.The checking in was so brilliant with Carl after a Champagne reception, showing us to the room and we wasnt disappointed, I had booked a superior with a sea view seen from the 4 poster bed. We found the air conditioning system to be very noisy at night and with temperature's as high as they was you need it on overnight,never the less I went to the local Pharmacy for some ear plugs.The television coverage in the rooms not so good being in Europe I was hoping to have a better coverage of the olympics. The poolside bar and staff are found to be outstanding where you get the most appreciation of the all inclusive wrist bands for the refreshment. We noticed that 'BRITS' are eager to get up early in the mornings to book there sunbeds each and every day so they can be in the same spot,Shame rearly as I found no problems getting a sun bed and the hotel purchased 50 more sunbeds so we enjojed having the extra time in bed!!!! The Restaurant is something else,First class food which we found amazing a different theme each night with a variety of foods Freshly cooked and the manager carrying out the duties for the pasta one evening. All waiter service and pleasant. The hotel is very clean and spacious and more important looks nice, the only one problem which we found is with the external steps leading to ground level, in the evenings are found to be dangerous with the lack of lighting,and noticed more than a couple occasions people slipped on them. The poolside entertainment and aerobics and the quiz was a nice way to stretch the limbs.The Thomson Entertainment team Gareth,Ruby,Rosie and Danny Well done a very good and pleasant team ,love the banter and great to get involved. The hotel resident duo Heaven Sent was very good to start off the evening and to finish off with.The imported entertainments we found not as good as we would have thought of,so we used the dacilities of the upstairs lounge area to relax in, alternativly Kolymbia has it's own little bars and knick-knack shops to have a look at. We hired a 250cc motorbike from the local hire company in Kolymbia to see the Island with ,we booked a couple of the trips organised by Thomsons and found them to be very expensive and not very good value for money.I am used to motorcycling and wether in a car or two wheels be very aware of the locals on the roads. We stayed at the Atlantic imperial hotel resort Rhodes, the staff were excellent went out of there way to make your stay as perfect as possible, hotel was wonderful, clean & beautiful decorated inside & out, the food as 10/10 so much to choose from even if you are a fussy eater, plenty of choice & everything freshly cooked & hot. The managers gala night on Tuesdays was magnificent with the staff applauded for their excellent service fireworks were spectacular & plenty of champagne supplied to all guests, the bar staff must be mentioned Antonio, stavros, tolis, andreas, anatasia, martha just a few to mention were absolutely brilliant with there charm & excellent service always happy & friendly who we will dearly miss, how anyone can complained about this hotel, will not be happy wherever they stay, must also mention cleaning staff freshly cleaned bed linen & towels every day excellent. with after the second day. made you welcome very entertaining. future well done atlantica imperial resort in kolombyia.